Welcome to the brand new SpringHill Suites Anaheim Maingate! We are located nearby Disneyland� Resort (0.5 miles) and within a short drive of many other Anaheim attractions including the Anaheim Convention Center, Honda Center, and the Angels Stadium. A shuttle to Disneyland� Park is available for a nominal fee.Our spacious guest suites (25% larger than a comparably priced hotel room) offer a seamless blend of style and function along with free WiFi Internet access, a microwave, mini-fridge, large work desk, and a spa-like bathroom to ensure your stay is anything but ordinary. 42" HDTVs with premium programming are a standard in every suite.Take a dip in our heated outdoor pool, unwind in our outdoor whirlpool, or stay in shape in our state-of-the-art fitness center. 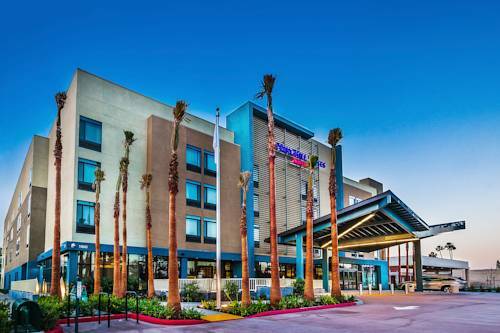 No matter what your preference is, the brand new SpringHill Suites Anaheim Maingate is the perfect choice for your Anaheim vacation or business trip.